Gossip Girl meets Mad Max in this breakneck thriller from an international bestselling author where the line between rich and poor is the line between life and death. ‘The windows on all the skyscrapers are smashed . . . No power, no lights, no people . . .’ When Skye Rodgers and her twin brother Red move to Manhattan, rumours of a coming global apocalypse are building. But this doesn’t stop the young elite from partying without a care. 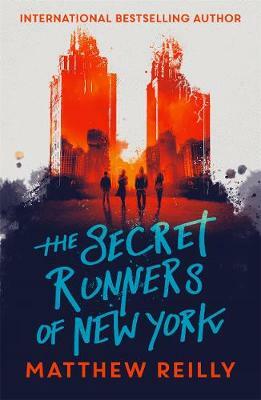 Then Skye joins an exclusive gang known as the Secret Runners of New Yok. But this is no ordinary clique. They have access to an underground portal that can transport them into the future. And what Skye discovers there is horrifying . . . What would you do to survive? Our YA Book Club for those in school years 9+ is led by Rosie. It meets every 4 weeks on a Tuesday during term-time, 4.45pm to 5.30pm, at the Shop.